Declan Rice’s decision to represent the Boys in Green is ‘pretty straightforward’, according to the assistant boss. Ireland assistant Roy Keane at today's press conference in Dublin. ROY KEANE HAS dismissed comments from West Ham co-owner David Gold that 19-year-old defender Declan Rice will be turned “into a strong England defender”. Rice was named in manager Martin O’Neill’s 26-man squad for next week’s friendlies, as his side prepare for a double-header against France and the United States. 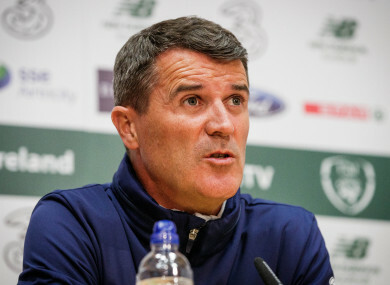 Although he will still be eligible to represent England until he lines out in a competitive match for the Boys in Green, assistant manager Keane reaffirmed the player’s commitment. “It’s going to be pretty difficult if he’s Irish,” Keane said when asked about Gold’s comments this afternoon. Rice enjoyed a promising debut season at the London Stadium, making 26 Premier League appearances last season. The defender played 90 minutes in a friendly against Turkey at the end of March, earning the man-of-the-match award in his first appearance under boss O’Neill. After being named Ireland U19 International Player of the Year, Rice confirmed he was committed to Ireland and quashed suggestions that he was in any way tempted to represent the Three Lions. “I’ve been playing with Ireland since U16 level, my mindset is fully on playing with Ireland,” he said in March. Email “'He's Irish. He plays for Ireland' - Keane responds to West Ham owner's comments on Rice”. Feedback on “'He's Irish. He plays for Ireland' - Keane responds to West Ham owner's comments on Rice”.